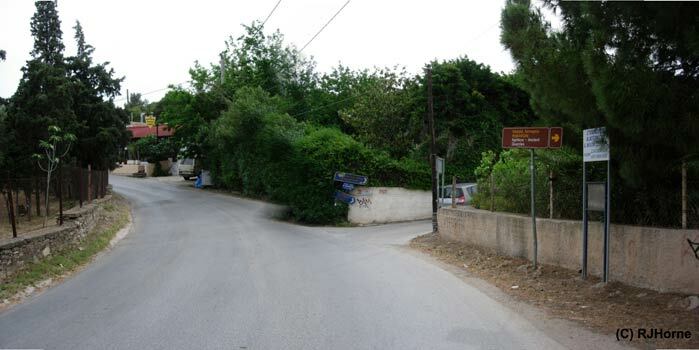 - Get on the Attiki Odos motorway heading in the direction of Markopoulo. - At 2.0 Km Exit the Attiki Odos motorway onto Leoforos Lavriou. - The road along here badly needs repair. Enjoy views of hills & sea to the left. Notice heaps of brown discard from various silver mines almost everywhere you look. - Look for a very small sign on your right saying "Xaos". From here if you wish, you can walk through the pine trees on your left hand side to see the huge chasm near the local hill called "Xaos" or Chaos. - Get back on the road and after couple of hundred metres TURN LEFT at the sign for the "Ancient Mine Workshop" (Sign location: 37°41' 34.80" N, 24° 00' 52.52" E), go to the end of the road and park. From here you have a wonderful view of the Souriza's valley and further down, the Agrileza valley. Steps go down to the mine workshops on the right hand side. - NOTE (2009) - A gate has been placed on the road to the parking area and may be closed. -Drive along the coastal road towards Sounio and the Temple of Poseidon. -Pass the turnoff to the right for Sounio and the temple (easy to miss). followed by a longish dark-green fence & gate. -Almost immediately after this you will see a Taverna on the left. -Slow down NOW and turn LEFT at the blue sign saying Ag. Konstadinos and underneath (Kamariza) and underneath this MINERAL MUSEUM (in English). You are now on the Kamarizas-Souniou road. Zero your Odometer here. CAREFUL, this turn is on a sharp bend and cars go along here fast. -You will go up a winding lane through houses, then up through the hillsides. Enjoy the views. - 5.6 Km after the Mineral Museum sign, turn RIGHT and park near the Ag. Triada church while you take a short rest in the shade of the trees & fill your water bottle from the tap outside the church, and make yourself comfortable (there are a few derelict buildings set in the trees). - Get back on the road, return the way you came, and after couple of hundred metres TURN LEFT at the sign for the "Ancient Mine Workshop", go to the end of the road and park. From here you have a wonderful view of Souriza's valley and further down, the Agrileza valley . Steps go down to the mine workshops on the right hand side. 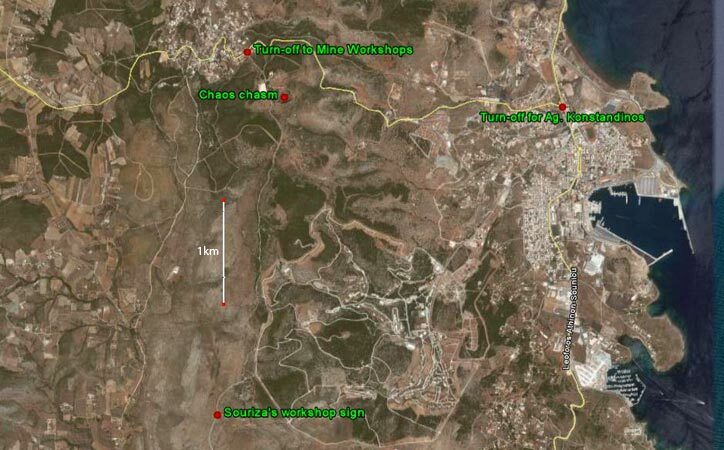 The turn-off on the coastal road for the mine workshops (to the right) coming from the Lavrio direction. (to the left) is more difficult to see. 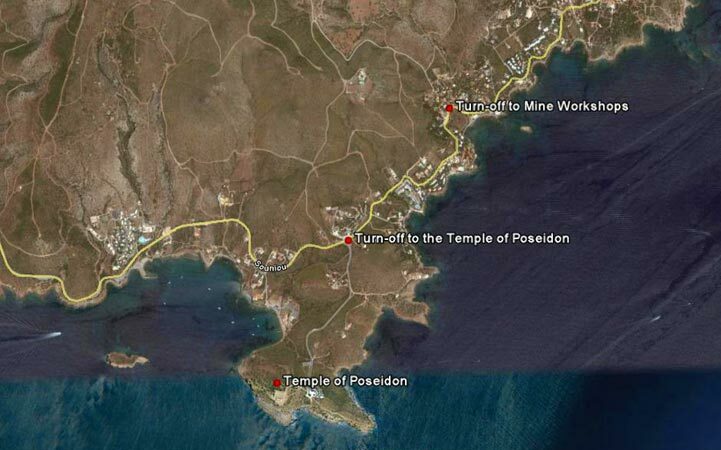 It is 1.2 km after the turnoff for the Temple of Poseidon at Sounio. Satellite view of turn-off to the mine workshops.